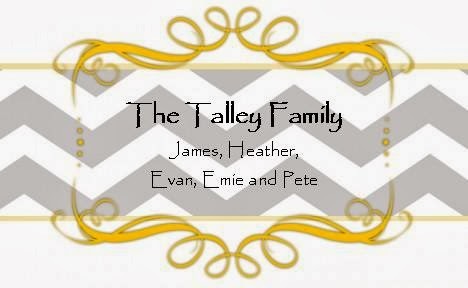 Things have been busy around the Talley house as we are gearing up for Christmas. Evan is so much fun to watch and listen to as he talks to his friends and others about Christmas. It brings me much joy to know that he really gets the reason we celebrate Christmas. Now, just as any four year old, he gets very excited to get up each morning and see what trouble McElfen (our Elf On A Shelf) has found himself in and he is looking forward to Santa coming. I love it that James is so into the "magic" of Christmas. Before we had Evan, he always said that his children would not believe in Santa--however, he typed a letter to Evan from Santa yesterday. Funny how a baby changes everything. It brings me joy to watch James rediscover Christmas in a whole new way. I am thankful for Evan and the excitement of his little four year old self! The start to our Christmas festivities is always Christmas On The Coosa. For those of you not from Elmore County, COTC events are so much fun! We enjoy our time together as a family, walking through the town and watching the Christmas parade. It was a fun-filled day--which ended with a shopping trip and dinner out at Mellow Mushroom (it was oh so good!). What a fun day! Evan's Christmas program at church was 2 weeks ago and they did a great job! He sings with the "Tiny Tones" at church, our 3, 4 and 5 year olds. They acted out a live Nativity as the Christmas story was being read aloud. They then sang a couple of songs and led the congregation in some songs. They did such a good job and were so cute! This past weekend was filled with a Sunday school family Christmas party and then our Christmas cantata at church. We had a great time fellowshipping with the families of our Sunday school class. We were able to get some great pictures of the kiddos, gathered around the manger (we managed to "dress" them to match the part-bath towels, kids belts and scarves go a long way!). So sweet. I must interject here a story about my Evan. When we all walked outside the Blackwells for the kids photo-op, Evan walked to the cross, stretched his arms out and said, "I am Jesus Christ. I'm on the cross--I died." We all stood there, looking at one another. It really put into perspective how much the little ones listen to and obtain. He got it right. I am so thankful that James and I made the decision as a couple to raise Evan in church and teach Him the ways of the Lord. Our Christmas cantata was great! The music was simply beautiful. The Children's Choir sang, rand bells and read scripture. The Students sang an upbeat version of "Angels We Have Heard On High", there were a couple solos, congregational singing and the adult choir closed it out. I heard people saying we sounded great! It was a fun night of singing praises to our Lord! We are looking forward to our first family Christmas gathering this weekend. We will celebrate with the Talleys. There is never a dull moment when we are all together, so I am sure it will be a blast! Too much food, a lot of laughter and good times! I promise to post pics soon! !